A soaring bird can take our hearts with her; in her flight we see an incomparable image of freedom. Conversely, there is no more potent image of mortal endings than her fall to earth in death. “Succumbing to gravity” she leaves the airs, expiring in the space of the earthbound before passing beyond. Pamela Lofts in two compelling series of drawings meditates on this final physical state. Her subjects are fallen Shearwaters, birds that undertake extraordinary migrations across the hemispheres. Without being told this, we can intuit it from the drawings. The last movement of each body speaks of a profound exhaustion, a life fully expended. 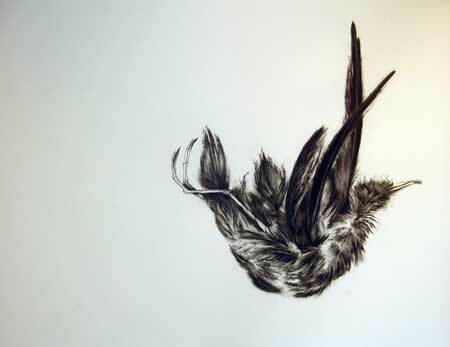 In the smaller drawings, the series of 16 titled Free Fall (a broken curve), the birds appear to have exerted themselves to the last breath, their wings outflung, their heads thrown back. In the five larger drawings that make up the series Landfall (wind-scoured), the birds seem to have drawn their energies into themselves. There is something more desperate in the Free Fall series, the birds’ desire to go on living, to regain the airs, enacted to the very last. With the Landfall series there is a surrender, a final folding of the wing and then no more. There is sorrow at the heart of this show, but the sorrow is leavened by the work’s meditative beauty. Lofts is a fine drawer. Readers familiar with her book illustrations will know that, but these drawings in the character of their mark-making are more like the work that won her the Alice Prize in 1995, Landscape (on the road again). This was a large-scale drawing of the decaying carcass of a kangaroo, a road kill. The scale allowed an ambiguous reading of the carcass as landscape; Lofts, who always has a strong idea at the centre of her work, was commenting on the brutality of the way we, in this technological age, move across the land. Her drawing was able to render the texture of matted fur, the many tones in its darkness, the contrasting tautness of sinew and muscle, the smooth hardness of claw and bone, which at the same time could all be seen as a tortured landscape under a sombre sky. The ambiguity in the current drawings is of a different order; the birds are unmistakably dead but still we see life in them, the essence of their lives – flight. With the mark-making there is a similar brilliance in rendering the textures and lights in the birds’ dark feathers, whipped by cold winds, the beautiful curve of wing, domed head, slender neck, hooked beak. There are two further elements to the current exhibition. The Sea (tide-washed) is a series of 21 small framed oil pastels, showing waves, sky, a distant headland in many moods.The framing is important. It emphasises the artist’s gaze into a space – the sea and the sky – about which there are unknowable qualities, an eternal “beyondness”. By contrast, the drawings are presented unframed, giving them a heightened immediacy, the physicality of the death of the body. Pinned to the gallery walls only at the top, the paper curves up and, with the smaller series, inwards at the bottom corners. These curves and their shadows cast on the wall create a double visual echo of wings, of remembered flight. There is also a video, on a tiny screen, titled Some sort of ending. It shows the unceasing movement of the ocean, a metaphor for the enduring breath of the world, the great life cycle in which we join, each for our time. A wave breaks on the shore, another comes. This exhibition, under the overall title Free fall (time after time), opened last Friday at Watch This Space, the artist-run initiative conceived by Lofts in 1991 and officially established in 1994. At the opening the current committee, through its chairperson Dan Murphy, announced the creation of an annual award for a Central Australian artist, named The Lofty in honour of the space’s initiator. Lofts and the five other founding members – Angela Gee, Pip McManus, Jan McKay, Mary-Lou Nugent and Anne Mosey – were also all given lifetime memberships. The award, in December of each year, will give the recipient $1000 prize money and the opportunity to exhibit at WTS in the following year with no charge for gallery costs. Free fall shows until July 22. Pictured, above: From the Free Fall (a broken curve) series. 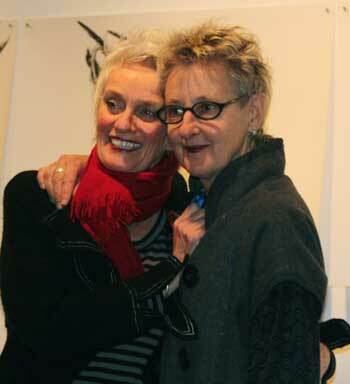 • Watch This Space initiator Pamela Lofts with founding member, fellow artist and friend, Pip McManus. Below: From the Free Fall (a broken curve) series. Installation. 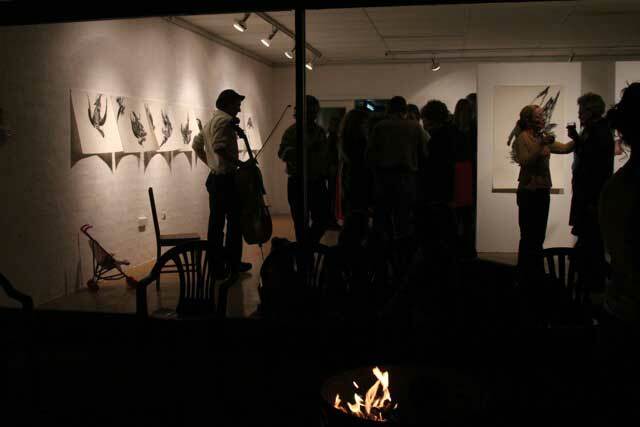 • Opening night of the exhibition at Watch This Space.